The Milwaukee PHP User Group invited me to speak at their January 2011 meeting, so I talked about PHP Hacking, or at least my perspective on it, with a talk titled: PHP Hacking: The battle between great ideas and not-so-great code. John Boutelle has a great intro called Slidecasting 101 which explains it all. I found the SlideCast tool pretty easy to use, my only complaint would be that I’d like to not publish my slides until the audio is synced. If there’s a way to do that, I must have missed it. This presentation is published under a Creative Commons Attribution-ShareAlike license. You can also see it at SlideShare. It’s interesting to see what I listen to, and who my top artists are, and all that jazz that comes with logging data… charts, graphs, etc. Fun stuff! But as you’ve seen, I’ve been on a kick lately to pull all that data back to my own site. (See Also: Scuttle rides again!, Tweet Nest: Archive Your Tweets, Data goes in, Data comes out., Reclaim What’s Yours… Take Back Your Data!) So I figured it was time to get the data I’ve been feeding into Last.fm since 2006 back to me, and back to my own site…. thusly “Heard” was born. Heard is a bit of PHP code I whipped up which uses the Last.fm API to pull my scrobbled data back to my own site and stuff it into MySQL, and from there it simply displays the data. Once again, this is my insurance policy. If Last.fm goes down, disappears, loses all it’s data, or something else happens, I’ve at least got an archive of all of my listening data. Last.fm is a great service, and they’ve provided a great API that makes doing these sorts of things possible, and I thank them for that. So Heard is really just some hacked together code right now… I don’t think I’ve spent more than a few hours on it, but it is functional, and syncs data once per hour. Once I implement all the ideas I have for ways to improve it, I’ll upgrade my version, and think about releasing some code if there is any interest in it. I’m a pretty poor PHP programmer, but I’m dangerous enough to build simple things. If someone else loves this idea and wants to run with it, let me know, and I’ll share whatever I can. 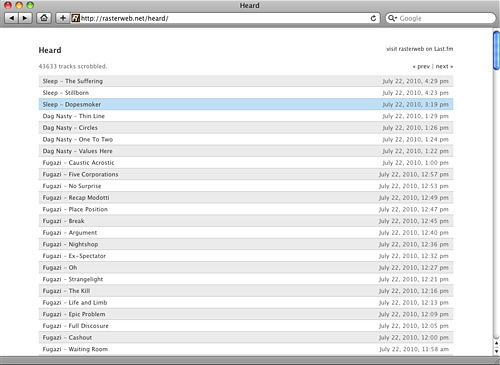 And yes, the design (or lack of design) of Heard is minimalist to say the least. 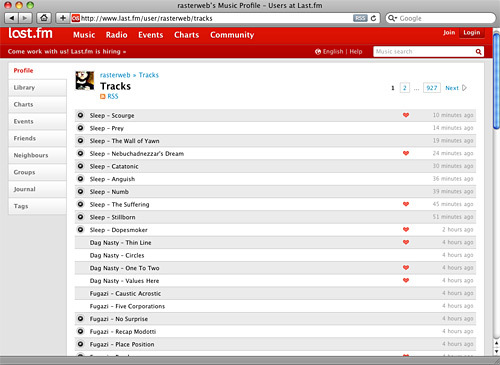 In one part it pays homage to Last.fm’s display of data, and in another part, I didn’t want to get too caught up in the look at this point, but I do have some plans for later. Update: The code for Heard is on GitHub. I’d love if people smarter than myself found ways to make it better. …for a little bit less error reporting/warnings about things, and that fixed it. Face it, even though Excel is a spreadsheet, the vast majority of users think it’s a database. Sure, why not? It’s got columns and rows and you can type data into it. Isn’t that what a database is? Even after all these years, when PHP and Java got bigger and stronger, and Ruby showed up and what not, Perl is still a great language for processing text and data, mainly due to the huge amount of useful modules available.